Hairspray follows on the same veins as movies such as Greese and Zanadu with classic storytelling where meets music and dance. Needless to say, the movie world has been lacking it's fair share of different films and fortunately Hairspray is a breath of fresh air in a time where the industry is stuck in a rut. 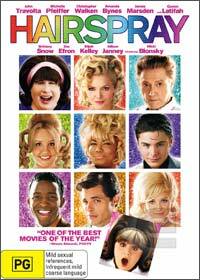 Set in the 1960's, the tale revolves around Tracy Turnblad, an overweight teenage who doesn't have a care in the world and apart from school and her family, her world revolves around the Corney Collins Show, a musical dance show starring the cheesy Corney Collins played by James Marsden (X-Men). When one of the stars of the show accidentally becomes pregnant, the producers seek another "cool" and "talented" "kid" and Tracy and her best friend Penny race down to the auditions to hopefully fulfill Tracy's dream of becoming part of the show. Unfortunately for Tracy, one of the shows stars Amber Von Tussle and her mother Velma (Michelle Pfeiffer) find the idea of Tracy dancing in their production outrageous and attempt to sabotage her role. Featuring John Travolta as Tracy's mother Edna who disapproves of her daughter's idea, the film is extremely "camp" from start to finish which features some quite memorable music scenes that will definitely make this a modern classic. The writers have also thrown in a variety of issues from the times such as Afro Americans not being allowed to dance on the Corny Collin's show with the white kids and the moralistic and fun loving Tracy sacrificing everything to change people's prejudices and hopefully become the boyfriend of Link Larkin at the end of the day, the stars hot young dancer. Hairspray is a fun ride from start to finish and one cannot help but bop along... Great stuff!